About half the population of the South Pacific Island nation of Vanuatu has been left homeless by a devastating cyclone that struck on Friday, flattening buildings, washing away roads and bridges. Cyclone Pam was a Category 5 storm comparable in strength to Typhoon Haiyan, which hit the Philippines two years ago and killed more than 6,000 people. 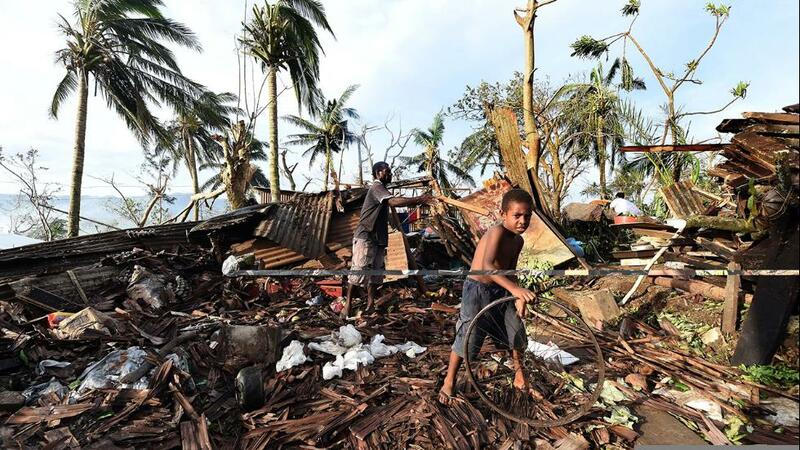 Now aid agencies say as many as eight people were killed during Cyclone Pam, and the death toll is expected to rise as rescuers reach more far-flung areas. Vanuatu has a population of about 250,000 people and is made up of more than 80 islands. Many of the buildings and houses has been completely destroyed. More than 90 percent of the buildings have been destroyed. People still haven’t come through yet. Cyclone Pam also caused major damage on other Pacific islands, including Kiribati and the Solomon Islands. UNICEF says the number of children who have been displaced or affected by the cyclone may be as high as 60,000. Vanuatu is a country made up of over 80 islands, 65 of which are inhabited. It’s in the Pacific, South Pacific Ocean. It’s probably about three hours’ flying time directly east of the east coast of Australia. So it’s a very remote place. The capital, Port Vila, has a population of around 45,000 to 50,000 people, it has a total population of about 260,000, spread out over those outer islands. Port Vila has been badly affected. Communications are up to Port Vila, so we are able to see what is going on there. And we’re seeing sort of 80 to 90 percent of buildings damaged. And in the sort of poorer shantytown areas of Port Vila, we’re seeing massive destruction to homes. And we’re seeing significant damage to other infrastructure, such as roads being washed away by the high seas and bridges being destroyed by high rivers and as a result of flooding. 90 percent have been damaged in Port Vila. Not all of those have been flattened. So the buildings that have concrete structures are still standing, but most of those have had their roofs ripped off. So, I think, still, in terms of, actually, what I’m seeing in terms of formal figures for casualties, it’s still sitting at eight, but that’s people in central Port Vila. I still think that the figures haven’t flown through from elsewhere. And obviously we’re not yet getting information from those outer islands, where we can just imagine that the situation is going to be grave. There has been some—now, some initial, first initial assessment to Tanna island, which is the major island in the South that was directly hit, and some aerial surveillance work there, and that is painting quite a grim picture in terms of the devastation to the housing and to the infrastructure, and anecdotal reports of people saying that they are lacking, you know, food and health facilities and those sorts of things. During the storm, Vanuatu’s President Baldwin Lonsdale was in Japan attending a U.N. conference on disaster reduction. Speaking Monday before he left to return home, he said the cyclone seasons his nation had experienced are directly linked to climate change, and described the extent of the damage. Many of the buildings and houses has been completely destroyed. More than 90 percent of the buildings have been destroyed. People still haven’t come through yet. They still have wariness, have emotional feelings. But it will take time. As the Pacific Island nation of Vanuatu is devastated by Cyclone Pam, 350.org co-founder Bill McKibben links the storm to global warming and responds to the new decision by the the United Nations Framework Convention on Climate Change to back the fast-growing divestment campaign to persuade investors to sell off their fossil fuel assets. This comes as University of Oxford alumni, donors and students are watching a vote set for today on whether the school will divest its endowment from the top 200 companies involved in exploring or extracting fossil fuels. McKibben also discusses news from NASA that California’s water supply could be exhausted by next year. Meanwhile, the environmentalist and former Maldives President Mohamed Nasheed has been sentenced to 13 years in prison after he was found guilty of ordering the arrest of a judge while in office. Nasheed became famous in 2009 for holding a cabinet meeting underwater to show the threat of climate change to his island nation. McKibben is the author of several books, including “Earth: Making a Life on a Tough New Planet.” 350.org has been posting updates about the situation in Vanuatu on its live blog at 350.org. The picture is extraordinarily grim. Port Vila, the capital city and the place with most of the infrastructure, took a huge hit. But the winds were higher, the seas were higher and the infrastructure much flimsier, to begin with, on many of the outlying islands, so the picture, I’m afraid, is going to get a lot worse before it gets better. The tragedy, the bottom-line tragedy here, as in so many other places around the world, is that Vanuatu’s development has been put back decades with this destruction of roads, bridges, hospitals, schools. This is what’s happening now around the world as people begin to kind of run on a tilted treadmill trying to develop on a disintegrating planet. And the people in Vanuatu know exactly what the culprit is. You know, in one of the most beautiful demonstrations of the climate change era, last summer Vanuatu and 10 other Pacific Islands’ Pacific Warriors, 350’s Pacific Warriors, built indigenous traditional canoes and took them off to Newcastle in Australia, the largest coal port in the world, and used them to blockade the great coal ships in an effort to demonstrate exactly what Cyclone Pam also demonstrated—the incredible vulnerability of so many of the poorest people in the world to the rising temperatures that we’re inflicting on our one Earth. If you’re low to the water on an island nation and the sea level starts going up, that makes everything that happens, every cyclone that comes, that much more dangerous. Even without a cyclone, in the Pacific earlier this month, the huge king tides in Kiribati flooded many, many homes and villages. Add to that things like the ongoing heating and acidification of the oceans’ waters and the concomitant erosion of coral reefs around the world. In many of these nations, coral reefs provide the best defense against a raging ocean. And that defense is breaking down everywhere. Add to that the fact that we keep seeing these super typhoons, super cyclones. You know, warm air holds more water vapor than cold. It allows, in arid areas, for more evaporation, and hence more drought. We’ll talk about California in a second. But once that water is up in the air, it’s going to come down someplace. And so, we see, from Boston, which just set yesterday the all-time record for snowfall, to places that are getting hammered by big storms, we’re seeing more and more and more devastating downpour. This is a worldwide problem. But, of course, places like Vanuatu are at the very sharpest end of the stick because they are so, so vulnerable. Aid agencies say conditions in cyclone-ravaged Vanuatu are among the most challenging they have faced. Relief flights – including from Australia – have begun arriving in the battered capital Port Vila after Cyclone Pam tore through on Friday, packing wind gusts of up to 320km per hour. But workers on the ground say there’s no way to distribute supplies across the archipelago’s 80 islands, warning it will take days to reach remote villages. The Save the Children agency says the challenges are worse than Super Typhoon Haiyan, which struck the Philippines in 2013, killing more than seven thousand people. Up to 50 people are reported to have been killed by Cyclone Pam, which brought winds of nearly 300 kilometres per hour when it struck Vanuatu, levelling homes, smashing up boats, destroying roads and bridges, and bringing down power and phone lines. But aid agencies say the real number is expected likely to be much higher as rescuers reach the outlying islands. Thousands have been left homeless on the archipelago. A Red Cross spokesman described the situation as ‘apocalyptic’ and Vanuatu’s government has declared a state of emergency. President Baldwin Lonsdale, who happened to be at a disaster risk conference in Japan, compared the storm to a monster. He said most houses in the capital Port Vila had been damaged or destroyed. President Lonsdale said the impact would be ‘the very, very, very worst’ in isolated outer islands but he held out hope the number of casualties would be ‘minor’. He had earlier made a tearful appeal for international assistance. Aid workers were particularly concerned about the southern island of Tanna, about 200 kilometres south of the capital, Port Vila. An official with the Australian Red Cross said an aircraft had managed to land there and confirmed ‘widespread destruction’. ‘Virtually every building that is not concrete has been flattened,’ the official said. Witnesses in Port Vila described sea surges of up to 8m and widespread flooding. Residents said the storm sounded like a freight train, with Port Vila left strewn with debris. Jackson Browne sing “Walls and Bridges” song from “in the Breach” CD.